The Youth Group is for our young people aged from 13 to 17. It normally meets at the Priests’ residence – St John Fisher House – between 5pm and 9pm on the 2nd Saturday of each month. 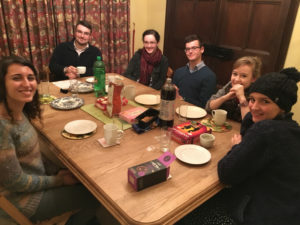 Activities include board games, DVDs of a spiritual or moral nature, discussions and debates, sharing a meal together, and talks by the Group’s Chaplain, Fr Phipps. A couple of times a year the Group visits a residential care home to play board games with its senior residents. For further information please contact Angela Grimer here. ‘Juventutem’ is for young men and women aged between 18 and 35. The Reading Group meets once a month and involves a social gathering including a talk given by its Chaplain. 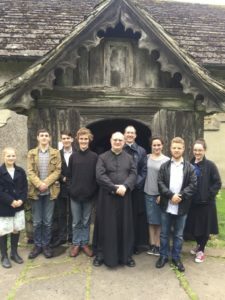 It is part of the Juventutem International Federation, an international Catholic network fostering the sanctification of young adults – members and others – according to the perennial traditions of the Latin Church. For further details, please contact Fr O’Donohue. This generally meets on the first Thursday of the month. 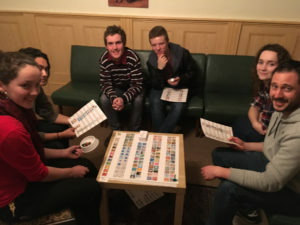 It gives an opportunity for the men of the Community to meet together at the Priests’ residence – St John Fisher House – for Mass, prayer, a little socialising and talks on the spiritual life by the Group’s Chaplain, Fr O’Donohue. 7:15pm Group commences in the House chapel with a prayer to St Bruno, silent prayer and Rosary. Confession is available during this time. 8pm Refreshments and chat followed by spiritual talk. 8:45pm The Group concludes with the singing of the Marian anthem of the season. There are also occasional day trips away, such as to the recusant manor house, Harvington Hall. This generally meets on the first Saturday of the month. 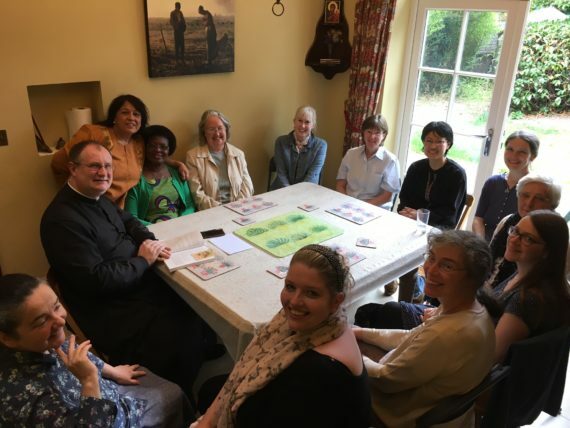 It gives an opportunity for the ladies of the Community to meet together at St John Fisher House for Mass, prayer, chat and talks on the spiritual life by the Group’s Chaplain, Fr Phipps. There are also occasional day trips away, such as to the Shrine of Our Lady of Consolation of West Grinstead, and ‘The College’ – Blessed John Henry Newman’s home in Littlemore near Oxford. 10am Mass in the House chapel. 12:10pm Group concludes with singing the Angelus and an opportunity for confession and / or spiritual direction. While the faithful of St William of York Latin Community are geographically dispersed – some are based in the Reading area, while others come from as far afield as Aldershot, Basingstoke, Oxford and Swindon – we are anxious to remain united in undertaking regular programmes of spiritual and corporal works of mercy. 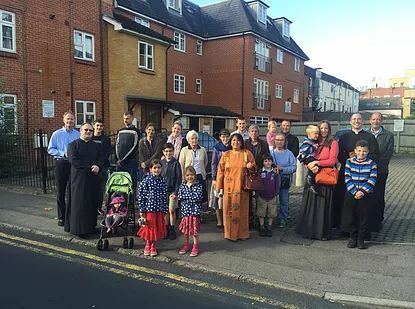 After our 8am First Saturday Mass, we have an apostolate of prayer outside of Reading’s BPAS Abortion Clinic, which is located at 121 London St, Reading RG1 4QA. There we pray 5 decades of the Rosary in reparation for sins committed against the Immaculate Heart of Mary and for an end to abortion. All are very welcome and we are pleased to be joined by parishioners from local parishes. We also have monthly pro-life Rosary intentions, which we recall in our daily Rosaries. ​Twice a year, in Advent and Lent, the Community undertake alms giving for charities. 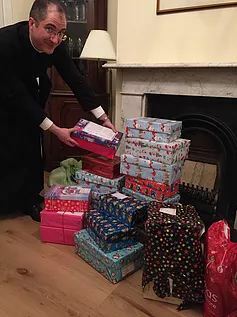 The Advent appeals are normally for the work of pro-life charities, such as the Good Counsel Network and the Catholic Children’s Society of Westminster. The Lenten appeals tend to be for other charitable endeavours, particularly to support our persecuted brothers and sisters in the Faith, through charities such as Aid to the Church in Need. In Advent 2016 we collected gifts for the Catholic Children’s Society’s ‘Christmas in a Box’ campaign for children from disadvantaged families; and in Lent 2017 we collected £1,005.63 for the Syria appeal run by Aid to the Church in Need. For members of our Parish with children of school age, the question of education is a particularly pressing one. Whilst some of the children attend local schools, many parents have taken the decision to home-educate. Some have just started on this journey; others have been educating their children at home for several years and now have young adult children at University, in the workplace or starting families of their own. Catholic parents choose to home-educate for a wide variety of reasons. Some simply feel that school is not the best learning environment for their child; others feel that the particular school local to them is not suitable. Some feel that home-education will give a stronger sense of unity to their family; others wish to make faith formation a priority in their child’s education. Yet others feel that they wish to offer their child a more ‘traditional’ or classical education, or, again, a more relaxed, less test-oriented education. 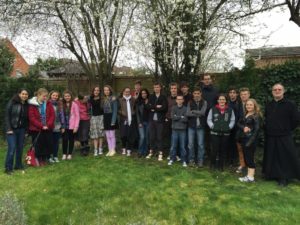 Here in Reading we run a group which is affiliated with the Guild of Catholic Home Educators, a national support network for families throughout the UK. Our group is run by a team of home-educating mothers from our community and caters to children from ages 0-16. We meet together once per week for four hours, eight weeks per term, to share educational and social activities. Parents remain on the premises at all times and all help out in some capacity. 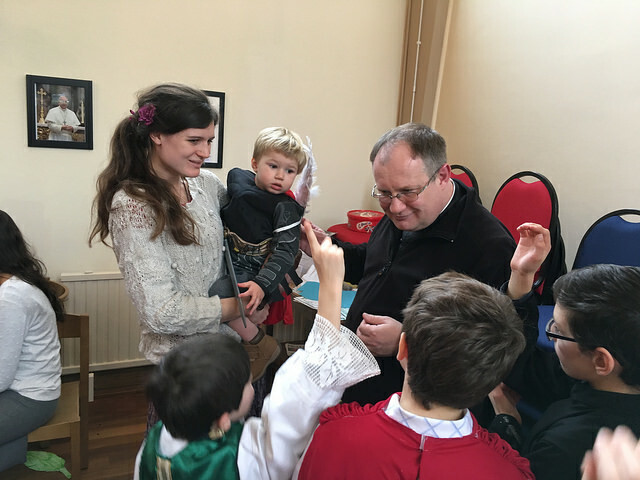 Our Guild group is openly Catholic in nature: the day begins with Mass, prayers are said at various intervals and all the children attend age-appropriate classes in catechesis. The meetings thus provide an opportunity for fellowship and support with like minded families.